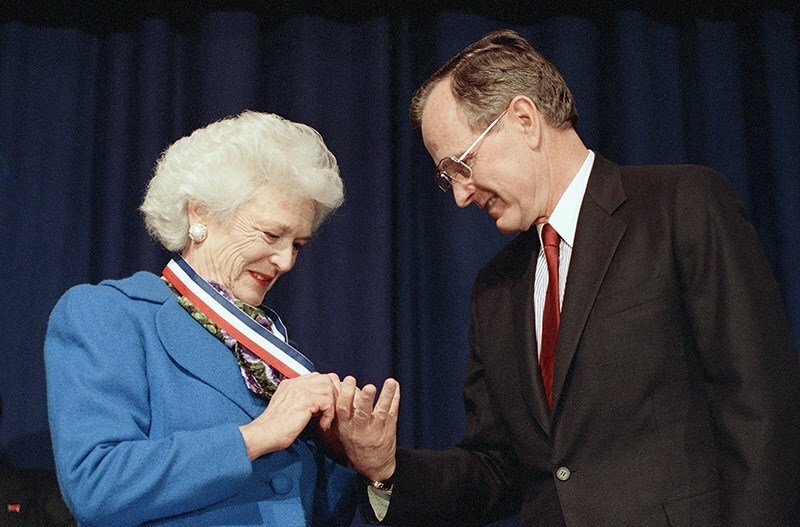 HOUSTON (AP) — Barbara Bush, the snowy-haired first lady and mother of a president whose plainspoken manner and utter lack of pretense made her more popular at times than her husband, President George H.W. Bush, died Tuesday, a family spokesman said. She was 92. 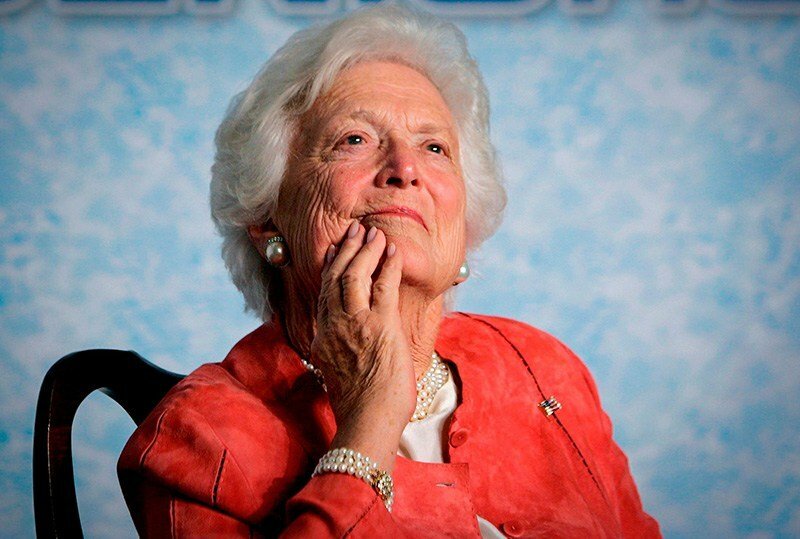 In this file photo from Friday, March 18, 2005, former first lady Barbara Bush listens to her son, President George W. Bush, as he speaks on Social Security reform in Orlando, Fla.
"My dear mother has passed on at age 92. Laura, Barbara, Jenna, and I are sad, but our souls are settled because we know hers was," former President George W. Bush said in a statement Tuesday. "Barbara Bush was a fabulous First Lady and a woman unlike any other who brought levity, love, and literacy to millions. To us, she was so much more. Mom kept us on our toes and kept us laughing until the end. I'm a lucky man that Barbara Bush was my mother. Our family will miss her dearly, and we thank you all for your prayers and good wishes." George H.W. Bush held his wife's hand all day Tuesday and was at her side when she died, according to Jean Becker, chief of staff at George H.W. Bush's office in Houston. A funeral is planned Saturday at St. Martin's Episcopal Church in Houston, which Mrs. Bush and her husband regularly attended. Mrs. Bush will lie in repose Friday at the church for members of the public who want to pay respects. Saturday's service will be by invitation only. U.S. President George Bush admires the Harry S. Truman Award for distinguished service that first lady Barbara Bush received from the Association of Community and Junior Colleges at their convention in Washington, Thursday, March 30, 1989. "Barbara Bush challenged each of us to build a better world by empowering people through literacy. As only one of two women in American history who can be called First Lady and First Mother, she was matriarch of a family that remains as dedicated to public service as it was to politics," said former Secretary of State and White House Chief of Staff James Baker III. 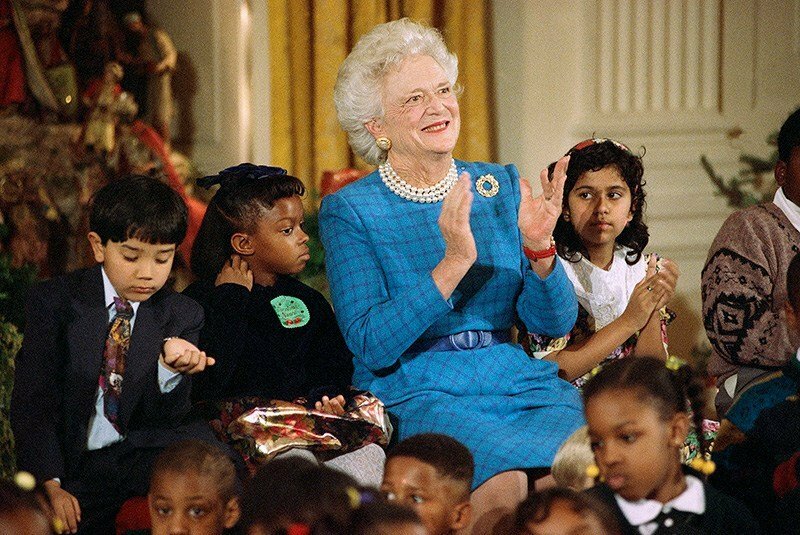 First lady Barbara Bush is joined by Washington area school children during a children’s Christmas party at the White House in Washington Wednesday, Dec. 11, 1991. 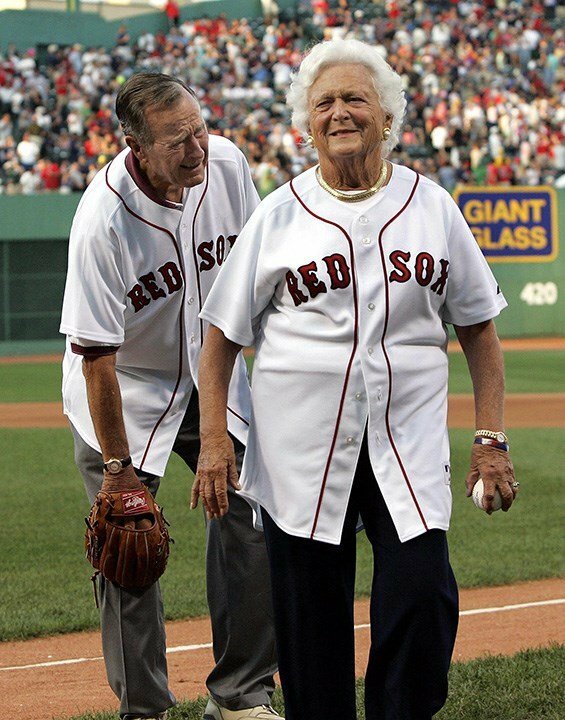 Former President George Bush grimaces as he rubs his knee while he and former first lady Barbara Bush leave the field after she threw the ceremonial first pitch before the game between the Boston Red Sox and the Texas Rangers at Fenway Park in Boston Wednesday, Aug. 10, 2005. 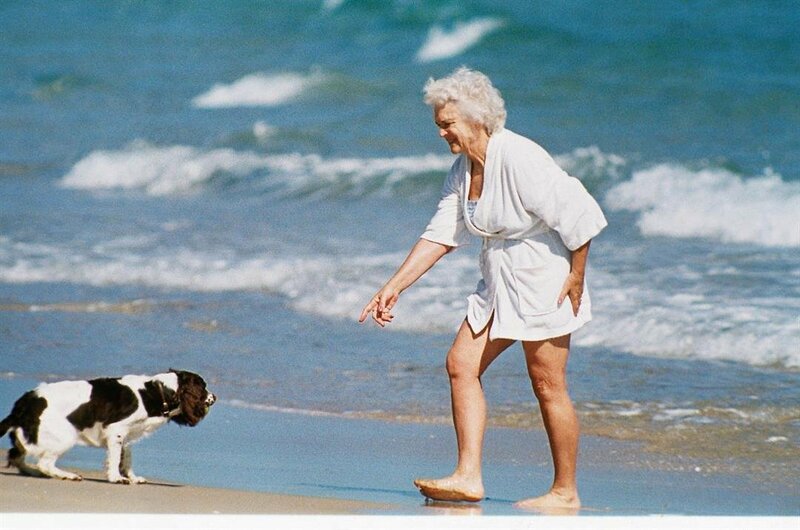 Mrs. Barbara Bush seen with her dog Millie at the beach in Florida in an undated photo. Video shows former first lady Barbara Bush in San Diego on March 22, 1995. During her visit, the former first lady was promoting her book, "A Memoir." She also helped raise money for the Resource Library at Sharp Mary Birch Hospital for women.